The picturesque village of Kailua-Kona, is alive with the spirit of Hawaii, both past and present. 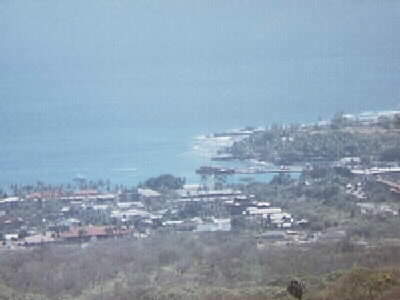 The village was the seat of government for King Kamehameha The Great after his successful campaign to unite the principal islands of the chain under one central government. A restored replica of Ahuena Heiau, the religious center of the King's compound, can be seen on the shores of Hamakahonu bay. Kailua village wraps itself around the calm waters of Kailua bay, along the waterfront one can find the Kailua Pier, from which you can embark on any number of different tours, glass bottom boats, zodiac raft trips, parasailing, submarine rides, sport fishing charters and sunset dinner cruises to name a few. Kailua is the home of the summer palace of King David Kalakawa, affectionatly known as the Merrie Monarch, for his part in the revival of the once forbidden art of the Hula, and ancient chants. Also found along the waterfront roadway, Alii Drive, is the first church to be built in the Hawaiian Islands. On a more modern note, Kailua-Kona is the home of the international Iron Man Triathelon, each October approximately 1,500 energetic souls participate in one of the most gruelling races to be found anywhere. Beginning with a 2.6 mile open water swim, followed by a 112 mile bike ride and finishing up with a 36 mile run, ending up at the finish line in the heart of Kailua village. Leaving Kailua-Kona the road goes both North and South, and either direction will afford you with many unforgetable scenic and cultural experiences. And the nice thing about it being an island, no matter which direction you chose, sooner or later you end up back in beautiful Kailua-Kona..